Using sealed lead acid batteries with your speed sign. Sealed lead acid batteries (SLA) have been used to power all kinds of speed sign for many years. Consisting of plates of lead covered in caustic acid this type of battery has been around for decades; it's a know solution, it's a proven product. 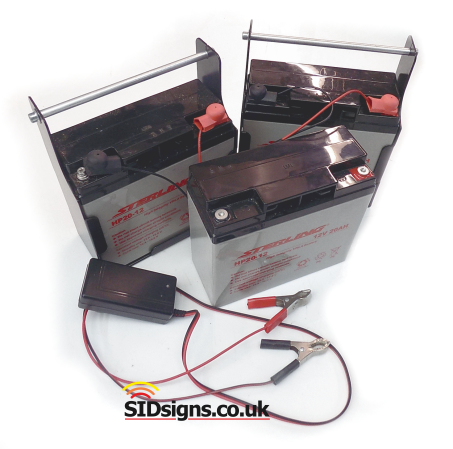 Due to the shape and size of our speed sign systems the size of battery is normally 20amp hour. At this power rating the battery housing is not too big, the amount of lead not too heavy. To boost the reserves of stored power further you can simply use two of these batteries at the same time giving 40amp hour. In some cases customers want a bigger store of power so it's simply a case of using bigger lead acid batteries. The biggest drawback with this battery is the size of them and the weight; the bigger the energy storage demand the heavier the battery. If you look closely at this photo you can see the battery caddy system which we wrap around each SLA battery. The caddy is manufactured from a piece of folded, powder coated aluminium with an aluminium rod handle. The purpose of this extra hardware is to make handling easier. This type of battery has small plastic finger holds for lifting and carrying, the caddy system replaces this with something more "hand friendly". All lead acid batteries are fitted with quick release electrical connections meaning no tools are required for changeover. As previously mentioned 20 amp hour sealed lead acid batteries have proven to be the ideal choice for speed sign applications. Recently all casework designs have been changed so two of these batteries can be run at the same time giving you the flexibility to double the amount of store power. 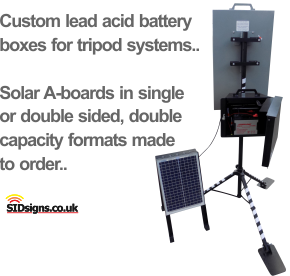 If you want to use sealed lead acid but need more storage then it's perfectly possible to produce suitable welded aluminium battery boxes for use with any speed sign. Simply tell us the amp hour rating you want to use and we'll design a system for you. What you get as standard. 12 month guarantee on the batteries & charger. As in-house manufacturers it's easy to modify existing lead acid battery enclosures to accommodate larger batteries or multiple smaller SLA devices.